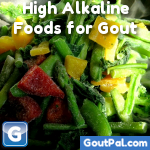 High alkaline foods are an important part of your alkalizing gout diet menu. Equally important is the need to be aware of pH balance. You must include acid-forming foods in your diet to ensure a wide range of nutrients. However, the typical Western diet is already far too acidic, so most of us need to introduce more alkaline foods. This high alkaline foods table replaces earlier versions. I have removed many irrelevant foods by using the USDA key foods list. I add a few additional foods that are of particular interest to gout sufferers. I have added some other nutritional values that are of interest to gout sufferers. You should take time to read why these are important by reading the Gout Foods Tables Introduction before you use the table below. The most important change is that I now present values for a 100 calorie serving rather than 100 gram. Listing by energy value rather than weight makes it much easier to adjust your gout diet menu so that your overall food intake has a lower PRAL score. By exchanging some acidic foods for items from the high alkaline foods table, you can easily improve your gout diet. Remember that these numbers are only a guide to improving pH balance. The only way to be certain that you have an alkalizing gout diet menu is to test urine pH. Note that, whilst these are more alkalizing, some foods, such as spinach, have high iron content, so a lower GoutPal Index. I will introduce personalized tools soon to allow you to generate your own Personal Index that is based on your nutrition goals. If you want to be included in the trials for this, please ask in the gout forums. The tables for each food group show all the key foods. I will publish tables in GoutPal Index order soon. Please subscribe to my gout information update service to get notified when I publish them.